Glass Fiber Reinforced Gypsum is one of the most innovative ceiling products we have used in the last several years. 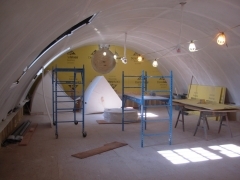 Traditionally, vaults and other complicated vaulted ceiling structures had to be formed with a complicated steel channel and light gauge framing system suspended from pencil rods or wires. The finish on top of the system was usually a time-consuming and heavy traditional plaster installation involving a scratch coat, brown coat and finish coat. The work was long and involved. The GFRG process breaks the ceiling structure into manageable sections which can be panelized in the shop and suspended in the field after fabrication. The panels themselves are shells in which a simple, light framework of wood and light-gauge steel can be covered with a thin layer of reinforced plaster. The expanded metal mesh is replaced with fibers mixed into the plaster to create the shells. The panels are made in molds that can be assembled on the shop floor, and any ceiling that can be constructed from repetitious elements is a good candidate for the process. The two major benefits are that the panels can be made off site and installed by a small crew as they are lightweight and easy to support. The net benefits are a shorter schedule and a lighter load to support. Once installed, the panels are taped together with paper tape and Durabond. 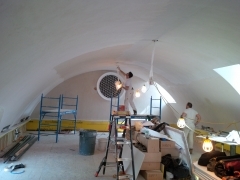 The whole surface is skim-coated with Durabond and a finished coat of plaster is trowelled over the base. 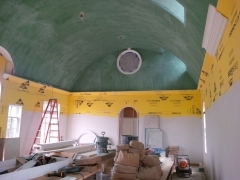 The shells can also be covered with moldings to decorate the ceiling. The net effect is a precise and crisp ceiling that has all of the gravity of a traditional plaster ceiling.